Dr. Akinwande earned his initial medical degree from the University of Ibadan and completed his residency in Internal Medicine at the State University of New York Health Science Center and Kings County Hospital in Brooklyn, New York. Dr. Akinwande then completed a cardiology fellowship at the University of Wisconsin Hospital and an Advanced Fellowship in non-invasive cardiology at the Deborah Heart and Lung Hospital in New Jersey. Upon successful completion of his medical education, Dr. Akinwande practiced cardiology and held leadership positions such as Chief of Cardiology at the Veterans Affairs Medical Center in Fargo, North Dakota and as Assistant Professor of Medicine at the University of North Dakota School of Medicine. He later joined a team of experts at Geisinger Heart Institute in Danville, Pennsylvania. Moving to Indianapolis, he became a partner with Indiana Heart Physicians in association with St. Francis Heart Center where he founded and was Medical Director of the Midwest Valve Center. Dr. Akinwande is a Fellow of the American College of Cardiology, the American College of Physicians and the American College of Chest Physicians. He is member of the Aesculapian Medical Society and the Association of Black Cardiologists. 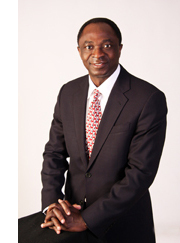 Dr. Akinwande is board certified in, Cardiovascular Disease and Nuclear Cardiology. Pinnacle Heart Specialists is currently accepting new patients. Contact us to make an appointment, referral, or to discuss your health and insurance concerns. Copyright © 2019 Pinnacle Heart Specialist. All Rights Reserved.